The Style Card's method of looking at behavioural types is, as we have already mentioned, somewhat limited in comparison to a full DISC interpretation. Its very simplicity, however, conveys certain advantages. One of these is that it can be applied remotely (that is, without any direct input on the part of the person under consideration). Indeed, with practice, most people find that they are able to categorise people directly as Drivers, Communicators, Planners or Analysts. Knowledge of an individual's basic style can be extremely useful, especially during negotiation. We have already looked at the motivating factors for different individual styles. In this section, we summarise the optimum negotiation strategies for the four main styles. Driver: Drivers relish control and authority. Whatever their situation, they will seek to dominate the proceedings, and this applies as much to negotiation as any other set of circumstances. To motivate them towards accepting an idea, therefore, it is important not to challenge this desire to dominate the negotiation, but to appear receptive and mildly submissive. By offering suggestions and hints, rather than attempting to directly control the Driver's decision-making process, they can be made more receptive to a proposal. This approach is often referred to as the 'Power' strategy. Communicator: Perhaps the most important thing to a Communicator is the building of positive relationships with other people. In a negotiation, therefore, it is important to build a social relationship with the Communicator if they are to be motivated towards accepting new ideas or proposals. A purely confrontational approach will, conversely, have a negative effect. Communicators are also interested in the experiences of other people, and discussions of the ways that a proposal has benefitted others in the past will also be of benefit. This technique is often called the 'People' strategy. Planner: Planners are perhaps the most compromising and malleable of the four main types. Their desire to avoid conflict or confrontation, and their wish to maintain positive and supportive relationships, means that they are willing to accept assurances and guarantees that might arouse scepticism in other styles. Planners will require time to reach decisions, and should not be forced to a conclusion before they are ready. This is the 'Promise' strategy. Analyst: An Analyst type will accept one thing and one thing alone - absolute proof that a proposal is sound. They will look into details and technicalities, and wish to explore issues of implementation and maintenance that other styles would quite possibly ignore altogether. It is vitally important that all of their questions are answered in full for them to feel motivated by a new idea. This is the so-called 'Proof' strategy. If you have read through the preceding sections, you will understand the idea of the four intermediate types (Assertive, Open, Receptive and Controlled) combining the different aspects of their adjoining main styles. For example, an Open behavioural style, linked to both the Communicator and Planner styles, responds best to a combination of the People and Promise strategies. For convenience, the four intermediate styles and their appropriate combinations of strategies are listed below. Looking for your own personality report? Understand your work style, help build your CV, and much more with your own personal report. Learn how DISC assessment can help improve your recruitment process, team building and leadership development. Got a query about Discus? Want to know more? There are lots of ways you can get in touch, or follow us on social media. We look forward to hearing from you! Setting up a Discus account is quick and easy. All you need to do is choose the Discus package that suits you and take advantage of our great startup offers. If you still have any questions about Discus, one of our advisors will be happy to call you. Just click to set up a callback, and we'll be in touch at a time to suit you. Just enter your e-mail address, and we'll mail you access to a complete reference pack covering Discus and DISC. Thank you. Details of your Information Pack have been sent to the e-mail address you gave us. Give us your contact details and we'll get in touch at a time to suit you. Thank you. Your request has been sent, and we'll be in touch as closely as possible to the time period you specified. 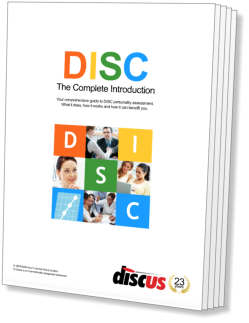 Just enter a few details here, and you'll be ready to download your free copy of DISC: The Complete Introduction. This information is for our administrative use only, and will never be passed to any third party. Thank you. Details of your download have been sent to the e-mail address you gave us. If you'd prefer, you can also download DISC: The Complete Introduction directly by clicking 'Download Now' below.